Maybe not a name some of you are familiar with, but if you like your pinball books, then you must know the work of today's Pinball Hero. 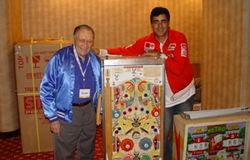 Pictured to the left with pinball designer Mark Ritchie, Michael Shalhoub's series of books cover several eras of pinball and are called The Pinball Compendiums. The Pinball Blog: So you're Michael Shalhoub, you've released a book every year for the last 5 or 6 years which must make you the most published pinball enthusiast in history. It must be a huge commitment but also very satisfying, do you have a particular highlight from the books? 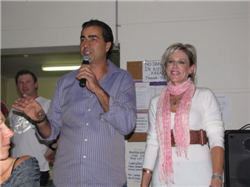 Michael Shalhoub: It has been an amazing journey I have been on these past few years, I fell in love with pinballs at the age of six. It was the Parker artwork that drew me in, the first game I ever played was a 1960 Kewpie Doll, I can still remember this game, I used a Coke box to stand on as I could not reach the flippers. I also remember playing a 1972 Gottlieb Flying Carpet, I loved this game as it was truly challenging, when I went home I built my own version using pegs as flippers. 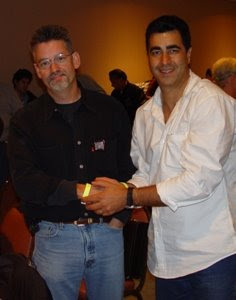 A thought that went through my head was the person who designed this game must be a genius, only God knew that many years later I would meet and become good friends with one of the Greatest Pinball Designers in the history of the game, a man who has designed more games than anyone else, Ed Krynski. The greatest highlights for me doing the books was meeting the great designers and artists whom I have had the pleasure in getting to know over the years as they are the reason the books were written. Only a few people have tried interviewing them, I made it my venture to interview everyone. The biggest highlight for me was back in 2003 when I inducted Ed Krynski into the Pinball Hall of Fame. This man once told me 'There is life after Pinball', Ed left the industry in 1984 on a very sour note, and here he was with his family around him tears in his eyes, a moment I will never forget. TPB: You're the owner of a desk once used by Alvin Gottlieb. How did you get it, do you use it today and is there a 'vibe' that comes from it, or is it just the same as any other desk? MS: The desk I have was David Gottliebs desk, it was given to me by Ed Krynski who used it when he worked at D Gottlieb & Co, it is currently in storage, it will be displayed in the Pinball Museum when it is opened in the section dedicated to Dave Gottlieb. We will have different sections dedicated to the Pioneers in the industry. When I first saw the desk I got Goosebumps as I envisioned Dave himself sitting next to it with a cigar in his mouth. TPB: Are you and Alan Tate still collecting trees to build a pinball museum in Australia and any idea when you'll have enough to get the project underway? MS: The museum is a huge project we have over 2000 games between us the majority belonging to Alan, the project is underway, there are at least 250 games that have been shopped/restored and are ready to be displayed. Now the work has begun on the building, Alan has purchased the perfect site for the building and work hopefully will begin on the huge building that will house all these games. TPB: I hear you've bought machines from America and had them shipped over. Ever had any interesting experiences to share from buying machines? MS: Back in 2004 Alan Tate and I were in Ashland Missouri were we were going to load a 40 foot container. When the driver delivered the container and unhooked the trailer, Alan commented it didn't look right as it was leaning to one side. I told him not to panic as I could see no problems with it. Anyway it took us two days to load it, the last thing we loaded were the backglasses. We started loading on the Friday and had finished on the Saturday going out to dinner after a huge job had been done. The next day Alan and I were going to fly out going to Wayne Neyens house. At 7.00am a friend of ours B.J Cunningham rang me telling me there was a accident last night and one of the legs on the trailer had given way and the container had rolled. Even talking about this brings back terrible memories as the was a lot of money invested in the games, we ended up hiring a crane, getting the container back on its feet. As we opened the doors to see what damage was done about twenty backglasses dropped out smashing on the ground. This was a terrible experience, thank God the pinball's were packed tight and there was no damage to them. TPB: With such a large area of land the pinball community in Australia must be spead pretty thin. Is there still a close-knit community of pinball enthusiasts despite the distances between you? TPB: I believe you think Ed Krynski is often overlooked as a pinball designer. Is there something about his work (other than the fact he designed 200+ games) that you particularly like and why is he under-rated in your opinion? MS: The one thing I loved about a game Ed Krynski designed, was he always knew how to challenge a player. This was the case for me on many games I played growing up. He has never been recognized for designing pinball, gun and arcade games for Keeney in the period 1960-1963. He brought so many innovations to the game: the vari-target first seen on Airport (1969); the laneways to the flipper first seen on Bank-a-Ball (1965); carousel target first seen on Dancing Lady (1966); multiple drop targets first seen on 2001 (1971). He has captivated players with his extraordinary designs that had Gottlieb dominating the industry from the day he took over from Wayne Neyens till the end of the 1970's. He knew what players wanted and the majority of the games he designed challenged players, and were a huge success for D Gottlieb & Co. I made it a personal venture to make sure recognition is brought to the man who has designed more games that anyone else in the history of the game. Sadly Ed is not with us today, personally, I am flooded with memories of his games and of the man that I have grown to love. I will miss having pepperoni pizza with him. Ed Krynski’s has designed more games than anyone, some he has yet to be credited for. He will be with me for the rest of my life, in the many games I have that he has designed, every-time I see one I start to cherish the many memories I have of him. When Ed left the industry back in 1984 he left on a sour note, wanting nothing to do with pinball's or anyone associated with them, thank God I helped change this. When I first tried contacting him back in 2000 he kept hanging up on me, until I one day talked with his wife Gilda who talked him into being interviewed by me. I feel him not wanting to take part in the early Pinball Expo's and not being there for people to interview him is the reason he was under-rated by many. TPB: Is there a holy-grail of collecting pinball machines that you still haven't found? 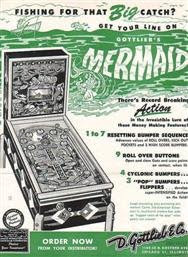 MS: The one game we don't have for the Museum is the 1951 Gottlieb Mermaid, one came up just over a year ago on EBay in the US and it went for over $17,000.00. Other than that we have hundreds of games from the 1930's, 1940's, 50's 60's all the way up to the modern game days. Including many gun and arcade games from the 1930's- today. TPB: You've bought containers of slot machines. Do you collect other coin-op machines or sell these to fund your pinball addiction? MS: The only slot machines i have bought are ones from the 1930's and 1940's these are to go into the Museum, I do collect other arcade games mainly gun games and Fortune tellers. 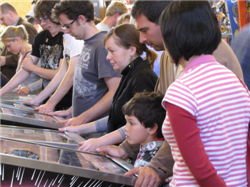 Alan in his collection has over 200 arcade games that will also be displayed in the Museum. TPB: Vegemite Nick & Nuggy from down under produced the Coconut Island pinball machine from scratch. Have you played the machine and what are the chances of us seeing any other machines made in Australia? MS: At the Pinball Expo in Sydney I got a chance to see Coconut Island, an amazing accomplishment by Nick and Nuggy. These two are extremely talented and I hope to see another game from them. I had a game on it and was surprised by how much I enjoyed it. There is talk of another company here manufacturing games but is all talk at the moment and I haven't seen anything. I will leave this here as people have given deposits and to date have seen nothing. TPB: Who would YOU like to see interviewed for Pinball Heroes and why? TPB: Finally, we always ask our guests to sum up their involvement in pinball in one word or sentence! MS: It has been a privilege and Honor meeting all my Legends, the greats who have brought us these games. Always follow your dreams, if you have a passion for something go for it. I have been on an Amazing Journey meeting many wonderful people from around the world. My books were written to pay tribute to all the designers and artists who brought us these games. I am also pleased to see the many people reading these books getting to know these greats, and enjoying a game I fell in love with many years ago called The Pinball Machine. Many thanks to Michael Shalhoub for taking the time to answer our questions and more Pinball Heroes coming soon. As always, lots of interesting historical insights from MS. Oh - and that 2004 story! Horrible stuff. Popadiuk's designs really are great. They're so unique, I would definitely call them "thinking outside the box." I wish I could find more of them to play in Utah, but such is life with collectible pinball machines.